Hahaha! 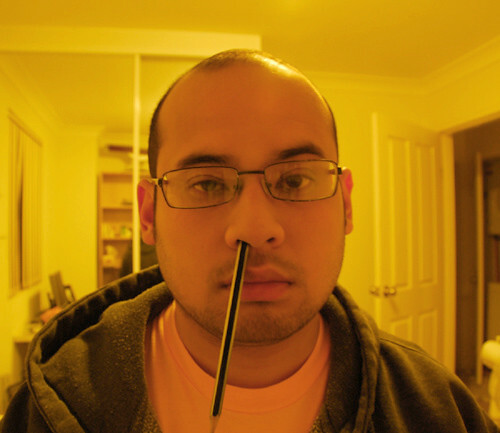 I have the first entry for pencilnosing: an act where you put a pencil or any long and thin tubular object resembling a pencil, for a long period of time (or at least until someone takes a picture of it) in between your nose and lips without any aid from your hands. 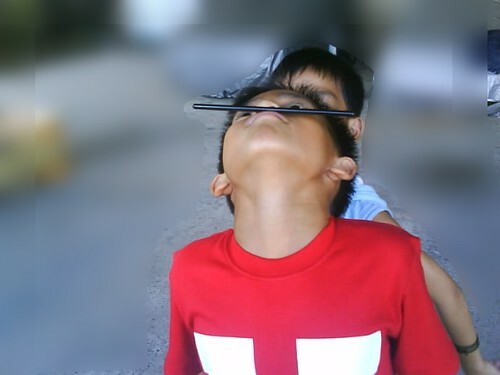 Here’s Senor Pablo‘s boy, juggling a straw! This was taken at Bridge Cafe, Melbourne. Thanks for sending it in! 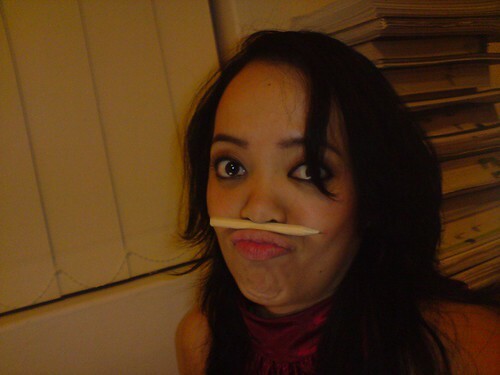 If you have any more photos of yourself or anyone around you pencilnosing, by all means do email it to me at maurina@gmail.com and I will post it up here! Oh for the shy ones, pixellations of face is allowed to avoid humilation and ridicule hahaha. Just make sure we can see the pencilnose! COME ON PEOPLE! Here’s Muaz Rashid in his work clothes forced to pencilnose using a pen in De Fountain Cafe in Kiulap! Hehe. Apparently taken using his laptop camera. It’s curiously clear. 😛 Thanks Muaz! Aren’t kids just ADOOOOOOOORABLE!? You can always count on them to paint a smile on your face and the straws help! These are my friend, Dewi’s (lady pictured wearing red) siblings, and they were sooooo iski! Hahaha. THANKS BABE! See why I have fun in school? I hang out with fun people who’d just about do anything for a laugh! LOL. This is fellow TESLer Bobby, home with a Rotring pencil! Hahaha. Only for hard-core sketchers! Here’s Miss Petite tired and yet sending in a picture! Hehehehehe. She had just woken up from a long rest following a field performance in KB. Hang in there girl! 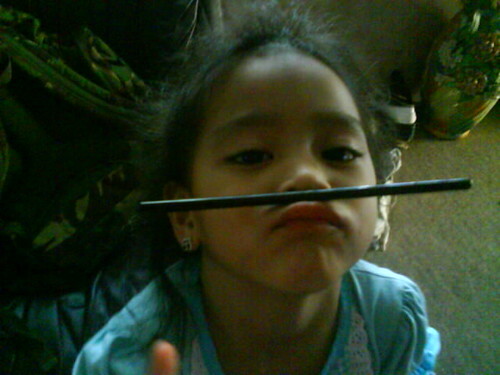 Oirul misinterprets pencilnosing *shakes head* NO OIRUL NO! The pencil must be in the horizontal position! Hahahahahahahahahahahaha! Taken all the way in Sydney, under yellow light! This girl apparently would like to be referred to as….. THE GRAPE ORACLE! 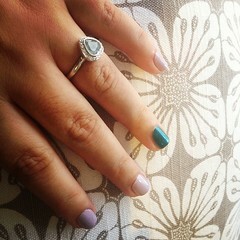 She predicts when grapes are ripe for picking! Hahahahaha, I love costumes! Makes pencilnosing much more…. interesting! Hahahaha! We’ve got a hostage situation going on here! 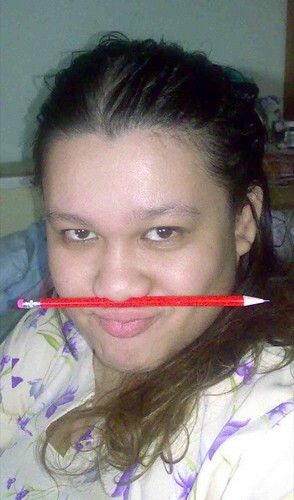 Pencilnose or ELSE! Here’s an entry sent in by folks at MY7THLIFE.NET. I shall not reveal the identity of the girl but lets just say she shares some DNA similarities with Miss Tina. Hahaha. THANKS GIRLS! It just keeps on getting better! 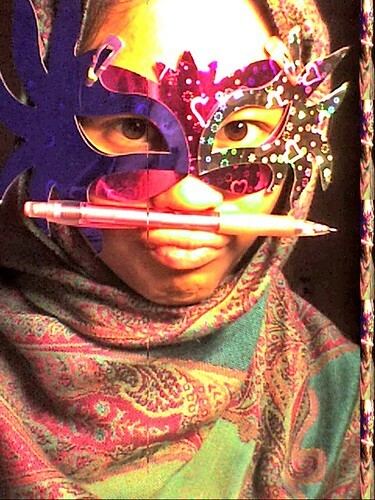 Here’s my cousin Suhaila the Foodblogger from Roses & Giraffes pulling a damn-you-I’m-pencilnosing-and-I-don’t-care pose! Hahaha. Thanks Gong! Macam orang samsing! 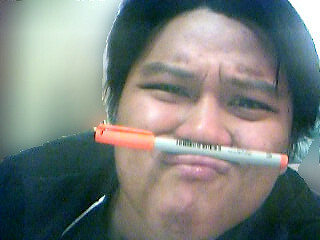 Hehehehe with an automatic pencil no less. Here is Dee, picture taken at home after a phonecall to a certain someone. Hehe. Thank you for participating girl! Hahaha! 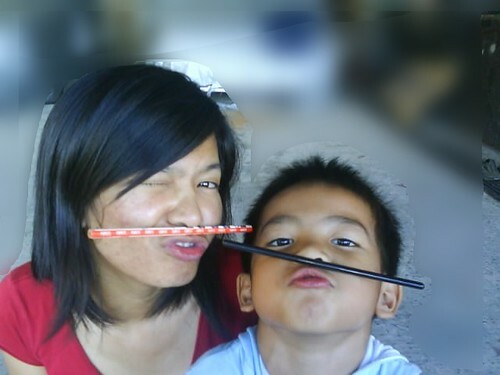 Here is a nominee for the shortest pencil, check out the surprised look on my cousin’s face! Miss Aiby here sent this in a few minutes ago. Picture taken in her friend’s room allll the way from Brisbane. Hahahahaha! HARIMAU BERANTAI! 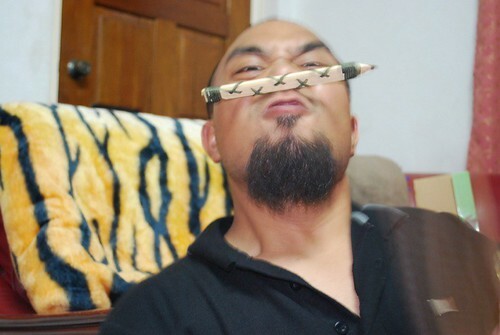 Tae Kwon Do master, Mila with his triangular pencil. 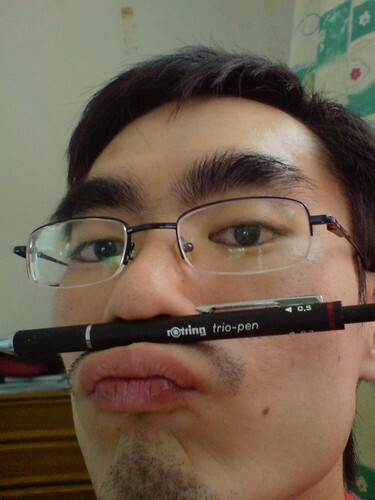 Apparently the only way he could pencilnose was by vacumming the pencil to his nose via his strong nose air. Hahahahaha! TRUE STORY! Taken in his room, which according to him is messy. Well, I guess he has never seen my room! Muahaha! 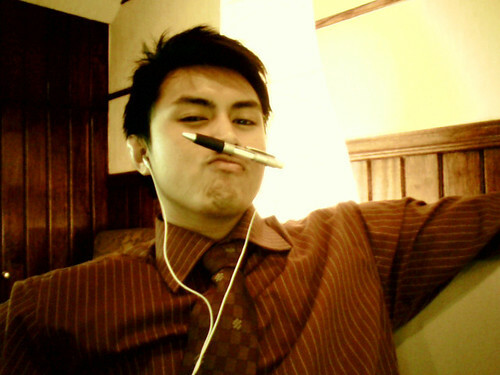 Here is Hasanul pencilnosing and looking rather constipated (!). Hahahahaha. This poor dude, one of my coursemates doing TESL as a minor, is stuck in bed on this Sunday suffering from gout. Apparently he accidentally ate some chicken liver hidden in the pitch black ayam kicap dish. Picture taken with a webcam. Hehe, let us all wish him well! I can’t believe I am still receiving entries for the campaign! All in the name of frivolousness! 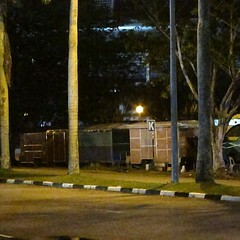 Here are some photos posted on Brunei Forever Forum in relation to pencilnosing. Good job BFF, I believe the first of its kind to unite Bruneians under the umbrella of photography. Good job! 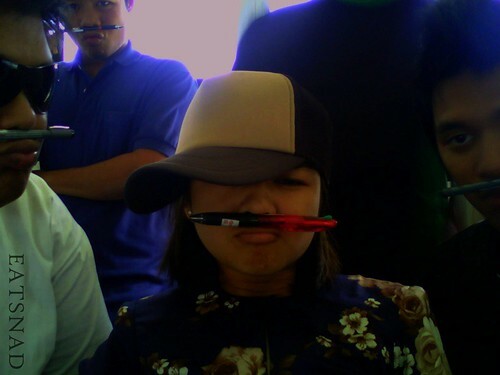 An entry submitted by Eatsnad, of her and her friends pencilnosing! 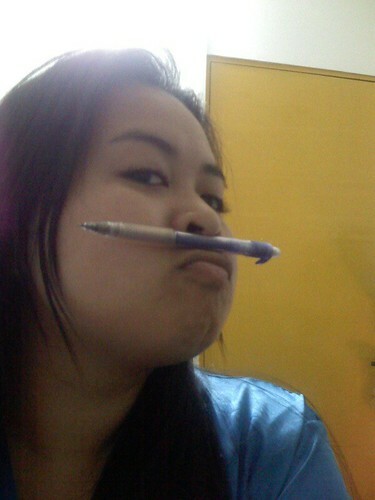 The nominee for most pencilnosers in one photo yet! Great job boys and girl! Queen of Personal Blogging sends an entry! I was just napping when I heard the familiar sound of a message coming through on my MSN. 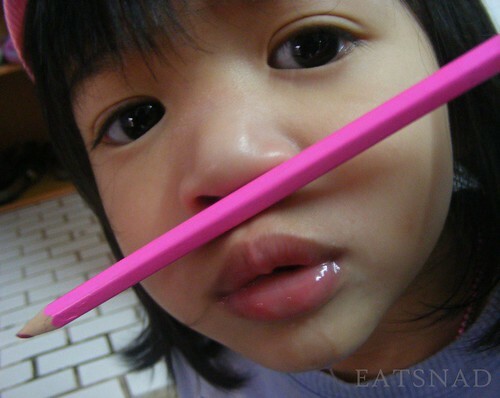 Turns out it was Nonnie King attempting to send her pencilnose entry. I opened it and was instantly laughing to see it done a la cheezburger. Hahaha! She said she looked like a cat in it so she spoofed the image. Clever that! Thank you for the entry Miss King! Pencilnosing? Pencilnosing indeed! 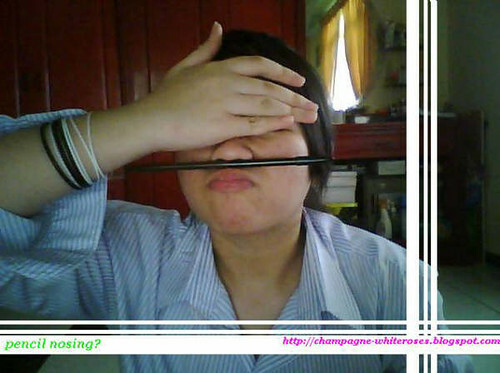 Good job Eyra from http://champagne-whiteroses.blogspot.com! She actually sent this in a few days ago but with my hustle and bustle, I forgot to post it. 😦 Sorry girl! But here it is, precious photo up and about. Thank you for the entry Eyra! Keep the photos coming people! I am still accepting entries! The funnier the better! ahahahahha.. 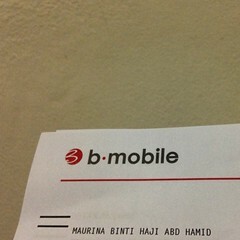 I know right.. the image looks so clear.. padahal it’s 1.3 megapix saja..
Lols Oh! the visible eyebaggies! I’m hanging in there… ! hahahahahahah! 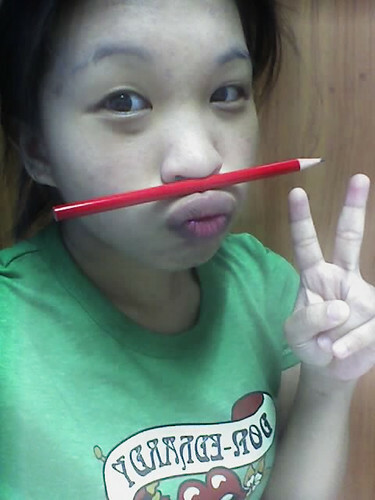 I think the pencil matches my green Tshirt.! hahaaa. Mau… u definitely started a trend! Takut ku karang ke MALL ramai orang mengikut!!! definitely! 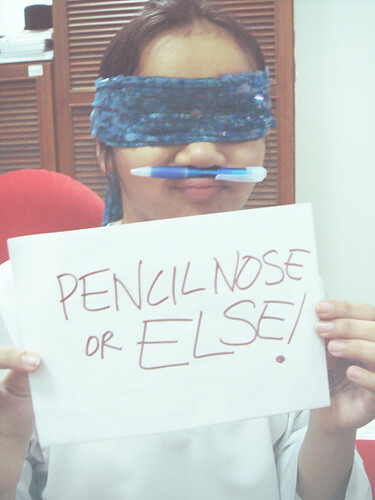 come and join in the fun and send in a picture of yourself pencilnosing at maurina@gmail.com! 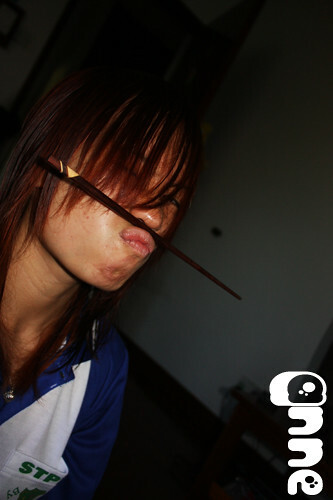 Ming…Hahaha meriah la!!! Tehibur ku! Everyone’s participating!!!! Very gud!!! hahaha… your campaign is doing great!!!! Haha! Those are funny, hehe. And no, I’m not gonna give my pic, I don’t know if I can do those stuff. 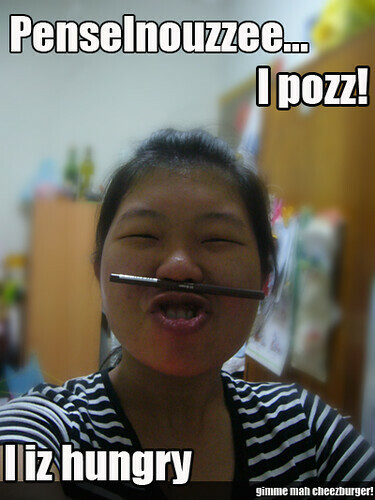 Haiz, should stop blogging for now, I should be on hiatus. Darn… blogger’s block left me when I need it. am surprised by the number of submits. =] good job. YENCHUAN!!!!!! U SHOULD SUBMIT AN ENTRY! You’re really good with the camera! Halo Maurina! those pics are hilarious! Haha!